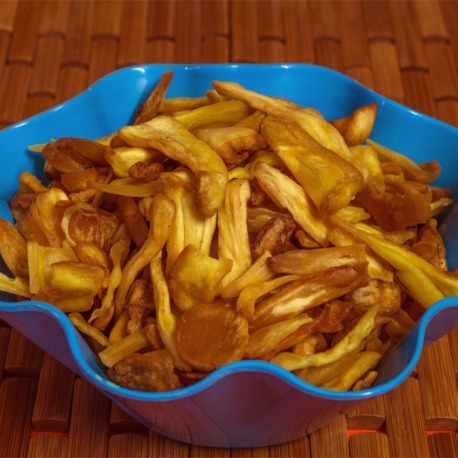 Jackfruit Chips – Have you heard of them? Are they worth a treat for tongue? The alluring pictures of the Jackfruit chips over the web tempted me to try them out and I wasn't disappointed. The Jackfruit chips are made of the starchy and fibrous flesh of jackfruit and they taste like a fusion of apples, mangoes, pineapple and bananas. Can you imagine the mash-up taste on your tongue? I can and it feels juicy and soft in my mouth. The well ripped yellow bulbs when dried or fried to the right flavor would not taste any lesser than anything but a delightful naturally sugary snack. To add glory to their taste, they have a yummy aroma and leave a delicate sweet aromatic aftertaste. To my conscience, jackfruit was an underestimated food until I realized it is the national fruit of Bangladesh and is the largest tree borne fruit. Just like we human beings have a family to belong to, fruits have one too and Jackfruit belongs to the rich species of Mulberries and Breadfruit. They have their native origin from South and Southeast Asia and thus their naming convention is also derived from Malayalam word 'Chakka'. And since we are going to talk about Chakka Upperi i.e. Jackfruit chips, we can't deny the fact they are another healthy offering from South India. Be it raw or ripen, jackfruit chips are versatile in their preparation from both of them but with a variance in their flavor. The well-ripped JACK is baked to the right texture to make dry chips; the low caloric for fitness freaks. They taste subtly sweet, kind of lightly citrus-y and mixed fruity. If chopping and eating this fruit seems a tedious process, chips are the best alternate especially when jackfruit has numerous health benefits to offer. Jackfruit chips are rich in Vitamin A, Vitamin C, calcium, potassium, iron, sodium and zinc apart from being the energy house of carbohydrates and natural sugar thus a full package compensation of the extra calories consumed with frying. I'm wondering if any considerable health rewards devouring these pulpy chips are being missed. They are the all-rounder. Jackfruits slow down the degeneration of bones, are excellent anti-cancer players being rich of Phytonutrients, reduce cardiovascular problems, a natural home remedy for Asthma patients, and prevent anemia and what not. Each nutrient available in Jackfruit chips saves your body from one or the other malady. Enriched in Vitamin C, they are the antioxidants to boost up body's immune system. The fibrous and dietary chips improve your digestion. Rich Potassium source pumps your heart muscles well and thus make you livelier. Oh yeah, how about Vitamin A; don't you want your eyes to keep tinkling for long without spectacles? Are you pregnant? If yes, is there something for you in this article? For pregnant women, jackfruit chips are a fruitful add-on to their diet. Jackfruit is crucial for fetal development and cell multiplication through mitosis. They are anti-ulcerative and anti-hypersensitive. They help one's body to control and regularize hormonal changes during pregnancy. Therefore, jackfruit chips are a savior for those lady lads who aren't fruit lovers and nutrient seekers. So are you ready to shop? Visit this group at https://groups.google.com/group/indian-food-recipes.